Making a documentary is different from making a fictional film but it’s not necessarily “less work because you’re just capturing real life.” What beginning or aspiring documentary filmmakers may not know is that documentary films often have scripts and involve tons of research, substantial budgets, and complex editing. In this article we’re going to break down, from a bird’s eye view, how to make a documentary film. No two documentaries follow the exact same path from conception to completion but what follows below is a rough guide for the process by which many documentary films are made. Not every filmmaking process will include every step, and many films will include additional steps beyond the basic ones listed here. Research & Writing – Every film starts with an idea. Sometimes for a documentary film, this might end up being quite different from the eventual finished product but documentaries often times start with a fair amount of research. That might including writing a documentary script or treatment for what you expect the film may include, and it may involve approximate hypothetical lines that you expect the people in your film to say. Many documentary filmmakers do all sorts of extensive research, much of which doesn’t actually make it into the film itself. Pre-interviews and interviewee selection – Unless you’ve already decided to make a documentary about a specific historical or living individual, you’ll probably need to do some “casting,” or deciding who will be in your film. If it’s a doc about a particular issue, say, climate change, you might need to choose which scientists or experts you want to interview. Most documentary filmmakers end up talking with many more people than actually end up in their film. You might conduct pre-interviews where you’re doing research into both who will be enough of an expert to be in your film, but also who seems like they can talk in an engaging manner. Simply being a subject expert is not enough to be “cast” in a documentary– you also need to be good on camera and able to speak in an understandable and engaging way that won’t confuse or put your audience to sleep. As the filmmaker or documentary film producer, you need to vet your film’s subjects and decide whether or not they’ll be good on film for the “role” you need them for. Sometimes even experts who aren’t well suited to speaking on camera (perhaps they have a stutter or they’re located in a remote location you can’t afford to travel to) can still sign on as advisors to your project which can help inform your process and answer subject area questions you encounter or give you feedback on rough cuts of the film later on. Fundraising & building a team – Next the filmmaker will create a rough budget for what it will cost to make the film. On a super low budget doc you might be able to self-fund it, but often times you’ll need to do some documentary fundraising either through a Kickstarter crowd-funding campaign or applying for media grants. There are many documentary film grant-makers but there’s also plenty of competition for their funds. Depending on the type of film you’re making you may also need to start building a team at this phase (hiring camera and sound technicians, an editor, etc). You’ll also want to secure any filming access you will need, like getting permission to film in a government building or confirming with your film’s interviewees or subjects that they’re willing to be part of your project. Shoot interviews & follow your subjects – Depending on the type of documentary you’re doing, you may be shooting a variety of material. For a historical documentary, you might be filming re-enactments and collecting interviews with historians. For a documentary film that follows a modern day living person as they try to accomplish a goal (run a marathon for instance), you might be filming them as they train and work to accomplish their goal. Of course, you’ll want to get documentary film release forms signed from all your participants so you can legally use the footage you shoot with them. Collect b-roll – B-Roll is the material that isn’t interviews in your film. If you’re making a film about woodworking you might want to collect lots of cool footage of people sawing wood or fitting joints into grooves or sanding rough edges or staining finished chairs. This footage will come in handy later when it’s time to piece together your interviews and other footage into telling a story. The b-roll can cover up edits that you make in your interviews and help you stitch together a visually compelling story. See our related article Creative B-Roll Ideas for Documentary Filmmakers. Find archival materials – Not every documentary film relies on old photos or archival video but many do. If your film does, you’ll want to find, collect and digitize those materials so they’re ready for you to use in the editing process. You’ll also need to get permissions and documentation that you have those permissions from the rights holders or creators of this imagery if it’s not in the public domain or covered under the fair use loophole. Editing – Depending on the length of your film (feature or short) your editing process might be quite long and complex or simpler. Feature length documentaries often start with a paper edit or a compilation of interview transcripts that roughly sketch out the structure of the film before any footage is actually edited. Shorter documentaries might just leap into the editing phase, making adjustments where the plan from pre-production didn’t quite match the finished results. You’ll also record any temporary and final voiceover if your documentary has narration. Getting feedback – Almost every film, nonfiction or not, involves a substantial feedback gathering phase once there’s a rough cut ready to be shown. Just like writing a book, you’d want someone you trust to read it (and preferably lots of people) before you send it off to a publisher for consideration, filmmaking is much the same way. Documentary filmmakers will often hold rough cut screenings of a few people like subject matter experts, general audience member types and other filmmakers to help figure out what the weak or unclear parts of the film are. These days you can also send a private link to the film via email for feedback to people. Polishing – Finally, once you’ve reached picture lock and your film is done with editing you’ll probably need to get a sound mix and color correction done to really make the film shine. If you have a film score composer they’ll also work during this stage to add custom music underneath some scenes. See our related article: How to boost film production values. Every film is unique and every film will have a unique distribution trajectory. What follows here are some examples of what the distribution phase may include, not every film will do each of these. Submit to film festivals – This is a common step in the indie filmmaking process. Documentarians might submit their film to submission services like Film Freeway that will, for a fee, send your film to various festivals around the world. If you’re accepted to some you may attend them in person to show your film, give Q&As afterward to the audience, and sometimes meet with other filmmakers or distribution representatives from companies if there are any in attendance who are interested in your work. Get a distribution agent to pitch your film to studios – This might be another step although not every documentary film does this. Submit your film to broadcasters like PBS – Specifically, PBS has their POV and Independent Lens for 1 hour long stand alone docs. Put the film online for streaming/VOD purchases – Online storefronts like Amazon, iTunes and others will allow you to market your film and sell directly to consumers. 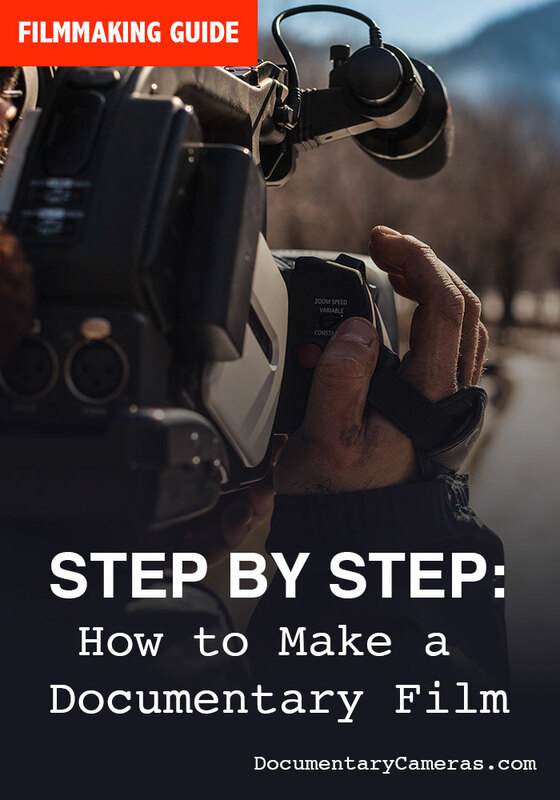 Not every film will include all of the steps in this step by step documentary filmmaking guide, and just about every film will include other unique steps that we haven’t mentioned. But hopefully, now you have a bird’s eye view of what the documentary filmmaking process is commonly like. Browse around our website for more documentary filmmaking information.